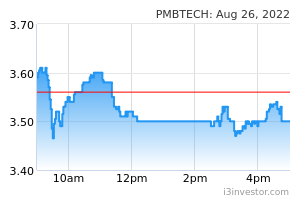 PMB Technology Bhd is principally an investment holding company. The firm is engaged in the manufacturing and/or distribution of access equipment and other aluminium related products and distribution of extruded aluminium profiles and related building materials. The principal activities of the group are: Design, fabrication, and installation of aluminium curtain wall, skylight and facade works, Fabrication and installation of aluminium formwork system, Manufacturing and marketing of aluminium access equipment and Trading and distribution of aluminium related products and building materials. The group manufactures access equipment like ladders and scaffold tower. Majority of the company's revenue is derived from Malaysia. ksks May I know what is the right issue for? I don't really understand about it. It can be sold? Mother share 7172 trade at 3.27 and way cheaper than the son. Can someone explain why this is happening? 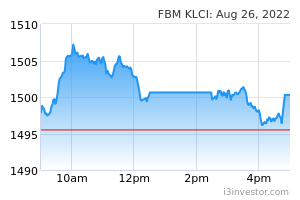 telusdansuci Pmb Tech-WA is on the way Rm 1.20 - 1.28 ? Kaunter yang boleh tetap boleh . Terima kasih banyak-banyak to 7172-WA . telusdansuci It's unbelievable for PMB TECH -WA to hit limit up on Friday . I believe by next week will hit another limit up again . I bought this 7172-WA on the first day of listing ( 18-7-2018 ) . Sometimes don't be too calculative and choosy or taking excessive care when making a choice . All of this methods are not suitable for me . PMB TECH & 7172 - WA , i am waiting for your good news by next week . Terima kasih banyak-banyak because both of you memang boleh dan tetap boleh . telusdansuci In another few more months , i believe PMB TECH 's market capitalization will reached 1 billion . Thank you to you PMB TECH because i know you can make it due to your company management teams . PMB TECH memang boleh dan tetap boleh . hero666 This announcement is dated 31 May 2016.
telusdansuci Cik abang , tolong tengok itu latest announcements dated 18/7/2018 , Changes in Director's Interest Section 219 of CA 2016 ) .Cik abang ,kaunter 0138 ada belikah ? Saya tambah nilai lagi iaitu pada harga Rm 1.33 pagi ini ya . Terima kasih ya . LYP1818 I heard that Bintulu silicone plant will be ready operation as schedule planned. LYP1818 dont know true or not. can someone check..
Daniel Yong Thanks for all your sharing, Telus. Really appreciate your pointers. I have benefitted. Jerry Tze Ming Very good management team, dont need to worry. huatong So quiet here. Getting ready to go. telusdansuci Now is the time to collect before this Pmb Tech forum is noisy . Be brave when others are fear . If Pmetal can make it no reason for Pmb Tech can't make it . Remember , Pmetal and Pmb Tech company are belongs to the same taukeh . Terima kasih banyak banyak . Jerry Tze Ming @telus, This counter is going to make plenty of wealth to us. Jerry Tze Ming Most of my portfolio is in here :) Going up is just a matter of time. telusdansuci @Jerry Tze Ming , as long as you can hold for it either Pmb Tech or Pmetal is no problem for you . We must always trust the management especially Tan Sri Dato Paul Koon , the CEO of Pmetal . Terima Kasih banyak banyak . Jerry Tze Ming Yes. I bought pmetal from 0.68 and sold at 5.4 haha. This is going to be better. limen12 can i ask @Jerry what is ur avg price for pmb? Yu_and_Mee pmbtech better than pmetal? Episcia Cupreata Interesting to see prices going up in the past few weeks steadily and maintained....more to come when new plant is in operation..
thequalityguy @Jerry Tze Ming, what's your holding duration from 0.68 to 5.4? I'm planning to go in today at 3.97. Advice please? thequalityguy Thanks Jerry. Timely info. thequalityguy What's going on now? Suddenly start to drop after lunch??? Jerry Tze Ming Stock price wont go 90 degree along the way. They will always stretch back to the moving average. Now is not a good timing to enter, bearish pin bar on boilinger band and very far away from moving average. It will probably go down for a while and it will still go up afterwards. Ahahah @Jerry, What is the right price to go in? shpg22 Downgrade fair price to 1.35 @ P/E 22x. Unjustified price inflated by hot air. telusdansuci New metallic silicon plant start running and doing business and i believe will bring more positive results in the near term for Pmb Tech . My target price is above Rm 4.00 .
mamatede Price at RM3.5 accounted for all the future earnings from their new plants. No point bullish more from here.